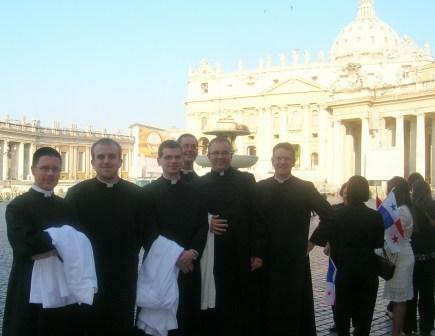 Pictured above, left to right: seminarians Kevin Drew, Erik Bakk, John Hammond, Brendan Johnson, Jason Keas, and Rome Experience faculty member Fr. Eric Nielsen. This entry was posted on Thursday, July 8th, 2010 at 2:59 pm and is filed under Faculty, What We Saw In Rome. You can follow any responses to this entry through the RSS 2.0 feed. Responses are currently closed, but you can trackback from your own site.